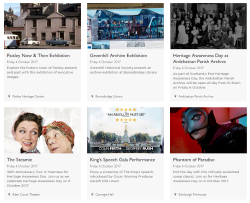 Friday 6 October is Scotland’s first ever Heritage Awareness Day, celebrating History, Heritage and Archaeology in the themed year 2017. Its taking place everywhere, the whole way across Scotland, everyone can take part, you can celebrate it your way. Heritage Awareness Day is a great way for you to share and celebrate heritage and what it means to you. Get involved and shine a spotlight on the historic environment, history and heritage that surrounds us all.